Written by a customer while visiting http://www.seidal.com/contactus.php? I bought this a month ago and it's been the best desk! So affordable for such a chic look! Just enough drawer space and top space for a simple laptop desk! Very happy with this piece. I am using it as a vanity for my bedroom. My room has antique furniture and this goes quite well with the dÃ©cor. Item arrived quickly and well packed. I thought the two back legs could've been aligned better with the mirrored part of the desk. Assembly was fast (thanks to my Hubby!) Overall very happy with it! I just received this console today and it took all of 10 minutes to put together, maybe even less. It's very beautiful in person and can easy go with any dÃ©cor. I just purchase the item and received it on Friday. very easy assembly. This item will bring out the entire area of the home. Just got this console in the mail today and I love how it turned out! The only downside to it is the bolts for the drawer portion were too small to attach the knob to it, other than that, it's great! I am absolutely in love with this table! 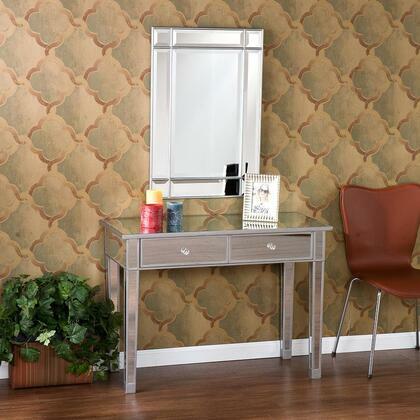 I personally used it as a vanity and I've been getting lots of compliments!! & not to mention the price was great!! This is a versatile piece suitable for a wide variety of home decor. I intend to use this console as a vanity in my bedroom, but it could easily be transitioned into an entry way table. Assembly was very simple and took less than five minutes. I'm excited about the possibility!